Frederick I (German : Friedrich I., Italian : Federico I; 1122 – 10 June 1190), also known as Frederick Barbarossa (Italian : Federico Barbarossa), was the Holy Roman Emperor from 2 January 1155 until his death. He was elected King of Germany at Frankfurt on 4 March 1152 and crowned in Aachen on 9 March 1152. He was crowned King of Italy on 24 April 1155 in Pavia and emperor by Pope Adrian IV on 18 June 1155 in Rome. Two years later, the term sacrum ("holy") first appeared in a document in connection with his empire. He was later formally crowned King of Burgundy, at Arles on 30 June 1178. He was named Barbarossa by the northern Italian cities which he attempted to rule: Barbarossa means "red beard" in Italian;  in German, he was known as Kaiser Rotbart, which has the same meaning. 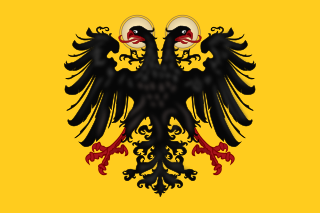 The Dukes of Swabia were the rulers of the Duchy of Swabia during the Middle Ages. Swabia was one of the five stem duchies of the medieval German kingdom, and its dukes were thus among the most powerful magnates of Germany. The most notable family to rule Swabia was the Hohenstaufen family, who held it, with a brief interruption, from 1079 until 1268. 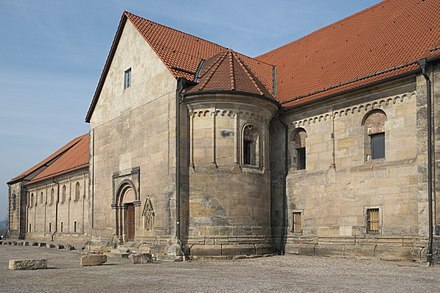 For much of this period, the Hohenstaufen were also Holy Roman Emperors. With the death of Conradin, the last Hohenstaufen duke, the duchy itself disintegrated, although King Rudolf I attempted to revive it for his Habsburg family in the late-13th century. Historians consider him among the Holy Roman Empire's greatest medieval emperors. He combined qualities that made him appear almost superhuman to his contemporaries: his longevity, his ambition, his extraordinary skills at organization, his battlefield acumen and his political perspicacity. His contributions to Central European society and culture include the reestablishment of the Corpus Juris Civilis , or the Roman rule of law, which counterbalanced the papal power that dominated the German states since the conclusion of the Investiture Controversy. The Corpus JurisCivilis is the modern name for a collection of fundamental works in jurisprudence, issued from 529 to 534 by order of Justinian I, Eastern Roman Emperor. It is also sometimes referred to as the Code of Justinian, although this name belongs more properly to the part titled Codex Justinianus. 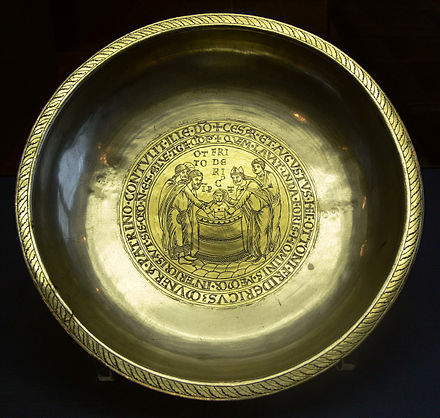 The Investiture Controversy or Investiture Contest was a conflict between church and state in medieval Europe over the ability to appoint local church officials through investiture. By undercutting imperial power, the controversy led to nearly 50 years of civil war in Germany. According to historian Norman Cantor, the investiture controversy was "the turning-point in medieval civilization", marking the end of the Early Middle Ages with the Germanic peoples' "final and decisive" acceptance of Christianity. 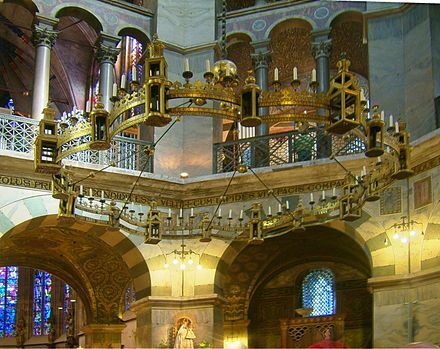 More importantly, it set the stage for the religious and political system of the High Middle Ages. 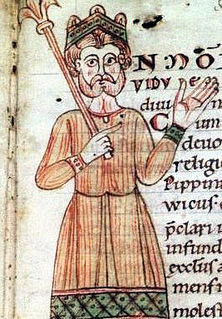 Conrad III was the first King of Germany of the Hohenstaufen dynasty. He was the son of Duke Frederick I of Swabia and Agnes, a daughter of the Salian Emperor Henry IV. 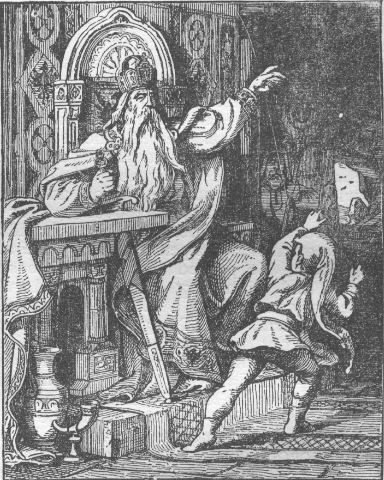 Henry IV became King of the Germans in 1056. 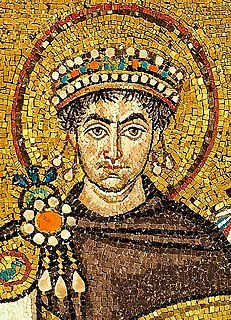 From 1084 until his forced abdication in 1105, he was also referred to as the King of the Romans and Holy Roman Emperor. He was the third emperor of the Salian dynasty and one of the most powerful and important figures of the 11th century. His reign was marked by the Investiture Controversy with the Papacy, and he was excommunicated five times by three different popes. Civil wars over his throne took place in both Italy and Germany. He died of illness, soon after defeating his son's army near Visé, in Lorraine, France. Henry the Lion was a member of the Welf dynasty and Duke of Saxony, as Henry III, from 1142, and Duke of Bavaria, as Henry XII, from 1156, the duchies of which he held until 1180. As Frederick approached the gates of Rome, the Pope advanced to meet him. At the royal tent the king received him, and after kissing the pope's feet, Frederick expected to receive the traditional kiss of peace. Frederick had declined to hold the Pope's stirrup while leading him to the tent, however, so Adrian refused to give the kiss until this protocol had been complied with. [ citation needed ] Frederick hesitated, and Adrian IV withdrew; after a day's negotiation, Frederick agreed to perform the required ritual, reportedly muttering, "Pro Petro, non Adriano -- For Peter, not for Adrian." Rome was still in an uproar over the fate of Arnold of Brescia, so rather than marching through the streets of Rome, Frederick and Adrian retired to the Vatican. The political result of the struggle with Pope Alexander was an alliance formed between the Norman state of Sicily and Pope Alexander III against Frederick. In the meantime, Frederick had to deal with another rebellion at Milan, in which the city surrendered on 6 March 1162; much of it was destroyed three weeks later on the emperor's orders. The fate of Milan led to the submission of Brescia, Placentia, and many other northern Italian cities. Returning to Germany towards the close of 1162, Frederick prevented the escalation of conflicts between Henry the Lion from Saxony and a number of neighbouring princes who were growing weary of Henry's power, influence, and territorial gains. He also severely punished the citizens of Mainz for their rebellion against Archbishop Arnold. In Frederick's third visit to Italy in 1163, his plans for the conquest of Sicily were ruined by the formation of a powerful league against him, brought together mainly by opposition to imperial taxes. Frederick Barbarossa, middle, flanked by two of his children, King Henry VI (left) and Duke Frederick VI (right). From the Historia Welforum . 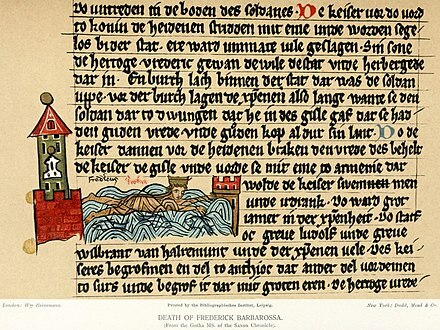 On 10 June 1190, Emperor Frederick Barbarossa drowned near Silifke Castle in the Saleph river. There are several conflicting accounts of the event. According to the chronicler Ibn al-Athir, Frederick was thrown from his horse and the shock of the cold water caused him to have a heart attack. Weighed down by his armour, he drowned in water that was barely hip-deep. 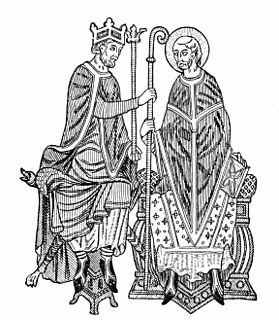 Lothair II or Lothair III, known as Lothair of Supplinburg, was Holy Roman Emperor from 1133 until his death. He was appointed Duke of Saxony in 1106 and elected King of Germany in 1125 before being crowned emperor in Rome. The son of the Saxon count Gebhard of Supplinburg, his reign was troubled by the constant intriguing of the Hohenstaufens, Duke Frederick II of Swabia and Duke Conrad of Franconia. He died while returning from a successful campaign against the Norman Kingdom of Sicily. 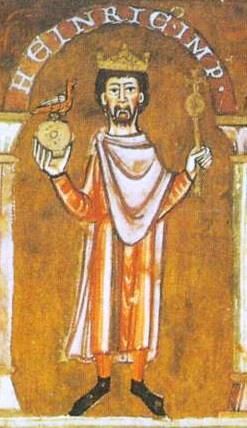 Philip of Swabia was a prince of the House of Hohenstaufen and King of Germany from 1198 to 1208. In the long-time struggle for the German throne upon the death of Emperor Henry VI between the Hohenstaufen and Welf dynasties, he was the first German king to be assassinated. Conrad, a member of the Hohenstaufen dynasty, was the only son of Emperor Frederick II from his second marriage with Queen Isabella II of Jerusalem. He inherited the title of a King of Jerusalem upon the death of his mother in childbed. Appointed Duke of Swabia in 1235, his father had him elected King of Germany and crowned King of Italy in 1237. After the emperor was deposed and died in 1250, he ruled as King of Sicily until his death. 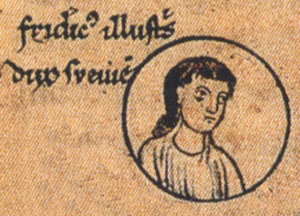 Frederick I was Duke of Swabia from 1079 to his death, the first ruler from the House of Hohenstaufen (Staufer). Frederick IV of Hohenstaufen (1145–1167) was duke of Swabia, succeeding his cousin, Frederick Barbarossa, Holy Roman Emperor, in 1152. Victor IV was elected as a Ghibelline antipope in 1159, following the death of Pope Adrian IV and the election of Alexander III. His election was supported by the Emperor Frederick Barbarossa. He took the name Victor IV, not accounting for Antipope Victor IV of 1138, whose holding of the papal office was deemed illegitimate. Antipope Paschal III was, from 1164 to 20 September 1168, the second of the antipopes to challenge the reign of Pope Alexander III. Henry IX, called the Black, a member of the House of Welf, was Duke of Bavaria from 1120 to 1126. Welf VI was the margrave of Tuscany (1152–1162) and duke of Spoleto (1152–1162), the third son of Henry IX, Duke of Bavaria, and a member of the illustrious family of the Welf. Adelaide of Vohburg was Duchess of Swabia from 1147 and German queen from 1152 until 1153, as the first wife of the Hohenstaufen king Frederick Barbarossa, the later Holy Roman Emperor. Maria of Brabant, a member of the House of Reginar, was Holy Roman Empress and German Queen from 1214 until 1215 as the second and last wife of the Welf emperor Otto IV. This article incorporates text from a publication now in the public domain : Chisholm, Hugh, ed. (1911). "Frederick I., Roman Emperor" . Encyclopædia Britannica (11th ed.). Cambridge University Press. ↑ Peter Moraw, Heiliges Reich, in: Lexikon des Mittelalters, Munich & Zurich: Artemis 1977–1999, vol. 4, pp. 2025–28. ↑ Falco (1964) , pp. 218 et seq. ↑ "Peace of the Land Established by Frederick Barbarossa Between 1152 and 1157 A.D." The Avalon Project . Yale Law School. ↑ Ua Clerigh, Arthur (1913). "Pope Adrian IV" . In Herbermann, Charles. Catholic Encyclopedia . New York: Robert Appleton Company. ↑ "Frederick I | Holy Roman emperor". Encyclopedia Britannica. Retrieved 22 August 2017. ↑ See entry for the contemporary chroniclers, Ottone and Acerbo Morena. 1 2 Kampers, Franz. "Frederick I (Barbarossa)". The Catholic Encyclopedia. Vol. 6. New York: Robert Appleton Company, 1909. 21 May 2009. ↑ Reprint of B. Arthaud. La civilization de l'Occident medieval, Paris, 1964. ↑ Davis (1957) , pp. 332 et seq. ↑ See Yale Avalon project. 1 2 Loud 2010, p. 19. ↑ Loud 2010, p. 111. ↑ Loud 2010, p. 64. 1 2 Loud 2010, p. 181. ↑ Cantor, Norman F. (1993). The Civilization of the Middle Ages. New York: HarperCollins. p. 309. ISBN 0060170336 . Retrieved 24 September 2016. ↑ Sidonius Apollinaris, Epistles 1.2, a description of Theodoric II of the Visigoths (453–66). See Mierow and Emery (1953) p. 331. 1 2 3 4 5 6 7 Gislebertus (of Mons), Chronicle of Hainaut, transl. Laura Napran, (Boydell Press, 2005), 55 note245. ↑ Schneidmüller, Bernd (2000). Die Welfen. Herrschaft und Erinnerung (819–1252). Stuttgart: Kohlhammer. pp. 134–135. ISBN 9783170149991. ↑ Kristó, Gyula; Makk, Ferenc (1996). Az Árpád-ház uralkodói [Rulers of the House of Árpád] (in Hungarian). I.P.C. Könyvek. pp. 79, 81, Appendix 2. ISBN 963-7930-97-3. ↑ France, Peter (1995). The New Oxford Companion to Literature in French. Oxford University Press. ISBN 9780198661252. ↑ Byatt, AS (October 18, 2002). "Here be monsters: AS Byatt is entertained yet baffled by Umberto Eco's latest novel, Baudolino, an uneasy mixture of history and fantasy". The Guardian. Retrieved January 18, 2019. ↑ "The Germans". Deutsche Wells. Wikimedia Commons has media related to Friedrich I. Barbarossa .